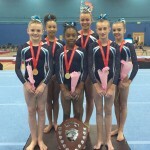 A weekend to remember for the City of Birmingham Gymnastics Club Women’s Artistic squad who triumphed to victory in the Bill Slater Junior British Team Championships, 19th/20th September. 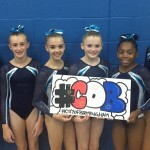 The event was held at Fenton Manor Sports Centre in Stoke-onTrent with thirty of Britain’s competitive artistic club teams but it was the 10pts difference that separated the City of Birmingham ‘A’ team score of 203.10 from their second placed rivals Sapphire GC ‘A’ team to place CBGC in a commanding lead. Congratulations to the outstanding team performances of Eden Edwards, Rachel Fraser, Taeja James, Hannah Leeson, Megan Parker, Oriel Powell and the injured but very present and supportive team member Alyssia Barlow showing true team spirit. Strong vaulting and consistency on bars highlighted a very good team result. A worthwhile mention must go to the City of Birmingham ‘B’ team of Miriam Allen, Sophia Cabrera, Kelsie Clohessy-Daly, Kristelle De Leon, Montana Leith-Mulley and Sofia Meadows, all between the ages of 9-11yrs; the girls finished in 11th place and placed some very good performances. Congratulations to coaches Jody Kime and Krystie Newton for their preparation of the girls and providing such a memorable result for City of Birmingham Gymnastics Club.